Back in 2015 I did a post on Vaunda Micheaux Nelson's Bad News for Outlaws: The Remarkable Life of Bass Reeves, Deputy U.S. Marshall, which was published in 2009. I'm republishing it below as a Black History Month observance. I happened to recall this book recently because last week the television show Timeless featured Reeves in an episode. Timeless is a time travel story, a genre I'm not that fond of as a general rule. In this one, the main characters go to a different time every episode chasing a bad guy who's doing something I don't quite understand and there are some other bad guys I don't get at all. But here's what I do get about Timeless. It's a show for history geeks. It's a show for those of us who sit on our couches watching it and shout, "That's Judith Exner! Judith Exner! That's Kennedy's mistress!" "Oh, you know, there was a serial murderer at the Chicago World's Fair and look how cool Houdini is in this episode." "Bass Reeves? I know him." The Bass Reeves' episode was actually called, The Assassination of Jesse James. But the character of Bass Reeves, and the actor who played him, left me thinking, Jesse Who? Something happens when a genre show aimed at a general audience features lesser known historical figures like Reeves. The show places those figures into popular culture where lots more living people have a chance to hear about them. It takes them out of their niche--Black history, say, or western history--and places them into history with a capital H. It gives them their shot at being remembered for what they did. We history geeks think that's a good thing, a very good thing. Bad News for Outlaws is a fantastic book. It's marketed to grades 3 to 6, so expect more text than in a traditional picture book. It is fascinating text, well-constructed as Bass Reeves' life story. The Reeves' story is told within the context of his world, as well. Just what was the deal with the so-called Indian Territory, anyway? And what were the deputy marshals vs. any other kind of lawman out in the west? Additionally, Nelson uses some great stories about Reeves' activities as a marshal to illustrate what was so interesting about him. And she subtly throws in language from Reeves' era. 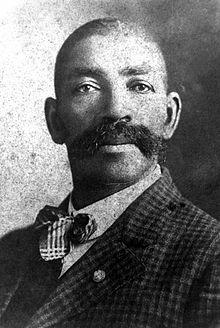 Historical photo of Bass Reeves from Timeless Wiki. 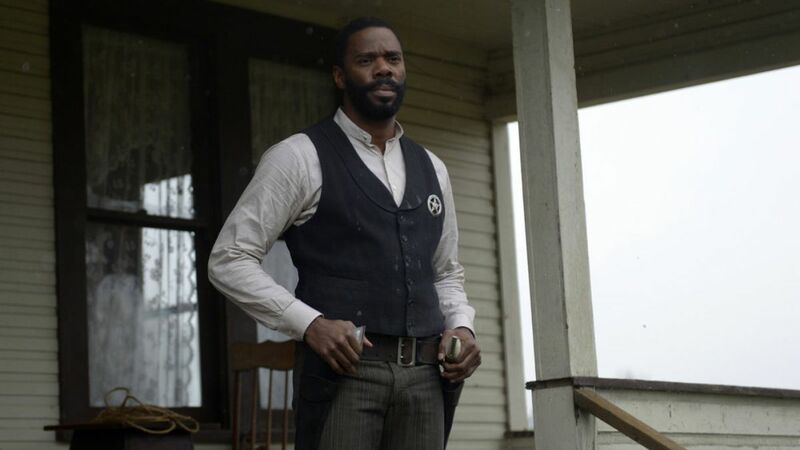 Photo of Colman Domingo as Bass Reeves from A.V. Club.